Toshio Yoshida (1928-1997) was born in Kobe, Japan. As early as 1953 his works attracted attention, notably that of Jiro Yoshihara who would found the Gutai Art Association in 1954. Encouraged by Yoshihara to boldly explore creativity at the intersection of painting and performance, Yoshida was one of the great original thinkers and innovators of Gutai alongside Kazuo Shiraga, Sadamasa Motonaga, Atsuko Tanaka, Shozo Shimamoto, and Saburo Murakami. The 1950s were particularly productive years for Yoshida. 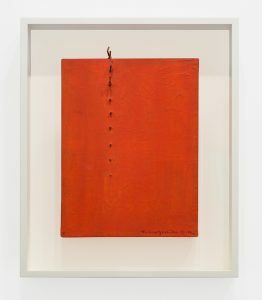 Not only did he create Red (1954), which includes a tied length of rope, Yoshida also created a series of Burn Paintings by searing and scarring plywood panels with a soldering iron or red hot coals. An example includes Sakuhin (54-28) (1954). 1955 saw the introduction of the Brushstroke paintings, which feature a single stroke of thickly applied oil paint on panel or canvas such as Sakuhin (56-12) (1956). 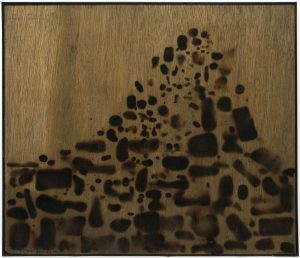 At the 1956 Second Gutai Art Exhibition, Yoshida poured India ink from a watering can onto a canvas from a distance of ten feet. This action would later be repeated in several works from the 1960s. Ever moving from one experiment to another, Yoshida’s Shadow installation at the 1957 Gutai Art on the Stage consisted of objects placed on stage with electric lights illuminating the objects to cast shadows onto the curtain behind them. 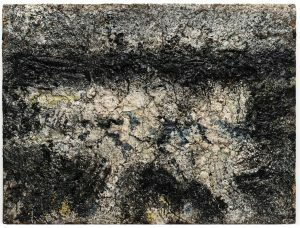 Shortly later, he created works built up with several layers of paint, resulting in a thickly crusted and heavily textured surface as can be seen in Sakuhin (61-10) (1961). 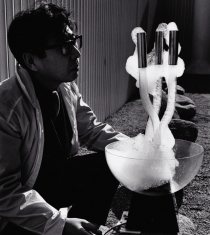 Exploring not only substantial materiality, Yoshida also investigated the ephemeral in the form of soap foam. From his 1965 paintings, where foam literally is piled onto works, to his installation Foam A (1965), where foam is continually pumped out to create ever changing shapes, Yoshida extensively investigates action, simultaneity, and time. Revisiting the technique of the watering can, works in the 1960s like Sakuhin (1966) heavily feature droplets of paint radiating concentrically from the center. Between the 1970s and the 1980s, he continued his interest in foam, from kinetic works such as Foam Pattern 2125, 1972, which consists of moveable circular elements within an acrylic box, to brightly colored works such as Zoshoku no Pattern No. 61 (1981). 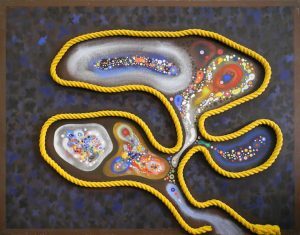 Bringing back the element of the rope, Yoshida reintroduced the medium in works dated to the 1980s, as can be seen in Rope-Loop 163, WAFT-233 (1983). These reoccurring themes and mediums in his oeuvre bring to mind circularity, continuity, and the realization that Yoshida had a profound understanding of his practice in linear time. Yoshida’s innovation before, during, and after Gutai is remarkable in its originality. 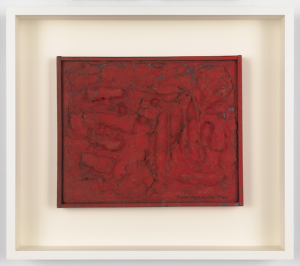 Though his creations are lesser known today than other Gutai members’ works and his international peers, there is no dispute of the artist’s important and growing place in the pantheon of the post-war avant-garde. Yoshida has been included in several Gutai retrospective exhibitions, including Gutai at the Jeu de Paume, Paris, in 1991; GUTAI: The Spirit of an Era at the National Art Center, Tokyo, in 2012; and Gutai: Splendid Playground at the Solomon R. Guggenheim Museum, New York, in 2013. Yoshida died in 1997.